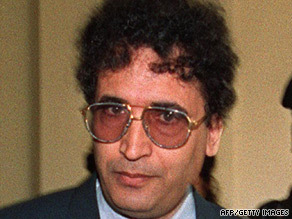 A Libyan man convicted in the 1988 bombing of Pan Am Flight 103 over Lockerbie, Scotland, is dropping his appeal, the Scottish Court Service said Friday. The move may be part of a deal convicted bomber Abdelbaset Ali Mohmed al-Megrahi is seeking with Scottish authorities to be released on compassionate grounds. Al-Megrahi, 57, is suffering from terminal prostate cancer. He is serving a life sentence for bombing Pan Am Flight 103 over the Scottish town of Lockerbie, which killed 270 people. It was the world’s deadliest act of air terrorism until the September 11, 2001, attacks, according to the FBI. A compassionate release could allow al-Megrahi, who has maintained his innocence, to return to his native Libya. The Scottish Court Service said al-Megrahi has lodged a “minute of abandonment” with the court, which is a legal move to drop an appeal. The court will hold a hearing Tuesday to consider it, spokeswoman Elizabeth Cutting told CNN. The Pan Am flight exploded December 21, 1988, as it flew over Scotland on its way from London to New York. All 259 people aboard the plane died along with 11 Scots on the ground.